To best prepare for your initial sauna appointment please read through this email and follow the link to the necessary paperwork. If you cannot print the form please arrive 5 to 10 minutes prior to your appointment to fill it out at our center. Click here for the sauna informed consent. It is recommended to have a moderate amount of food before your appointment and to stay well hydrated by drinking 32-64 ounces of water before and after your appointment to maximize the detoxification encouraged by the infrared therapy. 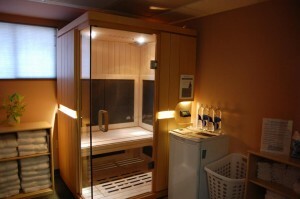 The sauna is in a private room and clothing does not impede the infrared waves. You can choose to go without clothes or to wear what you will be comfortable in. We provide towels and cold water. Only closed containers, like water bottles, can go into the sauna with you. We have a bathroom nearby but no shower so we recommend a rinse off whenever you get home so you don’t re-absorb what you’ve sweated out. Some main differences people notice between a steam sauna and the infrared sauna is that the infrared may not feel as hot because it is a dry heat, not wet. In addition, some people do not seem to sweat as much in the infrared sauna because it is heating you at a deeper cellular level and a lot of the detoxification goes on internally. Drinking lots of water will help flush everything out and maximize your experience.